Friends for Asia’s accommodation is safe and secure, and it provides a strong sense of community for international volunteers during their stay. Friendships forged here regularly outlast the time volunteers spend on assignment. 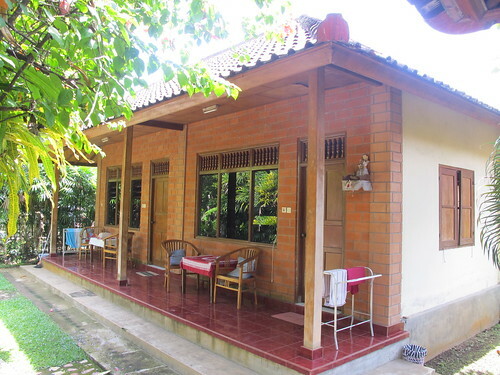 Our Bali Volunteer accommodation is set in a traditional Balinese style home. There are 12 rooms for volunteers. 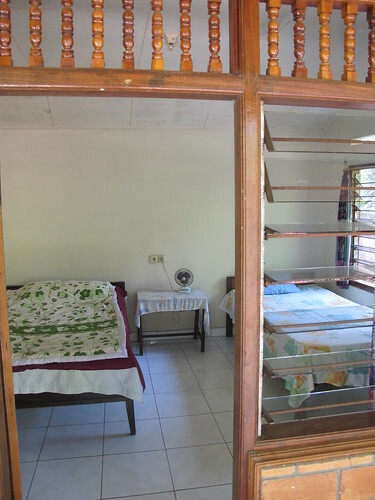 Each room has two beds, an attached bathroom with a hot water shower and western style toilet. Breakfast is provided for volunteers at the accommodation daily. Dinner is on your own, but being only 10 – 15 minute walk from the center of Ubud, you’ll have an array of dinner choices. The location of the accommodation is only a 5 minute walk from the schools in our English Education project. Other project sites are a bit further away, but transportation is worked out for those volunteers by our volunteer coordinators. Although our coordinating staff does not sleep at the volunteer accommodation, they are always available and will attend to any emergency that comes up, 24 hours a day. Bedding, and sheets are provided. Rooms are cooled by fans and the cool evening Balinese air. 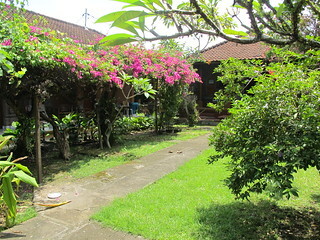 An older Balinese couple run the accommodation and are happy to assist volunteers with their needs. Free Wireless Internet is provided for volunteers in the communal area of the accommodation. As with most Balinese style homes, a samll temple to Hindu spirits is located in a corner of the property. Offerings are given to the spirits daily. Rooms are basic, comfortable and clean. If volunteering individually, then volunteers are placed in the rooms with another volunteer of the same gender. Whenever possible, we do try to fulfill requests volunteers may have about their accommodation needs. However, it is not always possible.